Sams mum recently adopted the most adorable bulldog puppy called Pumpkin! And this recipe was very much inspired by her. Too bad she can’t eat any! Preheat the oven to 180C. Spray 3x 7″ cake tins and line the bottom with baking paper. If you don’t have 3 you can bake them one at a time. Mix together the pumpkin, sugars, oil, vanilla, coffee, eggs and water. Beat with a wooden spoon until combined. In another bowl sift the flour, baking powder, salt and spices. Spoon the mixture into the 3 tins, being careful to ensure there is an even amount in each tin. If you only have one tin, spoon out a third of the mixture. Bake for 35 – 45 minutes or until a skewer comes out clean. Remove from the oven and leave to cool on a wire cooling rack. Mix the coffee with a little hot water, just enough for it to dissolve. Set to one side to cool. Beat the butter with an electric whisk until light and pale. Add the icing sugar and beat again until fluffy. Add the coffee and beat again until all the coffee has combined. Store in the fridge until you are ready to use it. 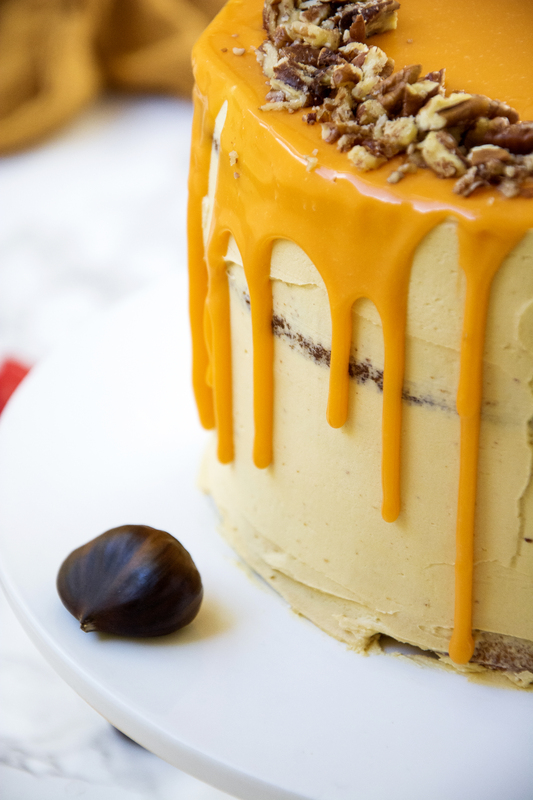 When the cake layers are cold, using a long serrated knife, level off the top so that they are even. Sandwich together alternating layers of cake and icing, ensuring that your icing layers are an even thickness and that your cake stands up straight. Using a spatula, ice the outside of the cake with icing and smooth down well. Cake smoothing tools really help with this, but a standard spatula will do just fine. 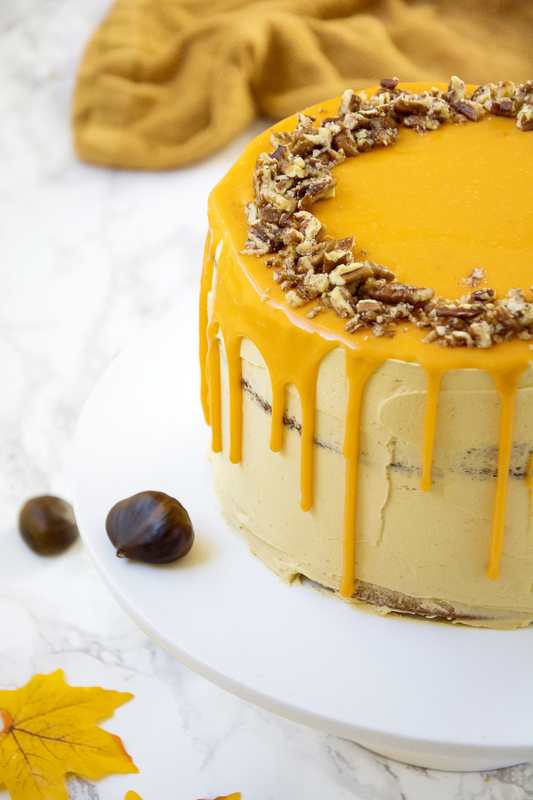 Store the cake in the fridge until the ganache is ready to drizzle. In a small saucepan, heat the cream over a medium heat until just bubbling. Remove from the heat add the chocolate, stirring until its fully melted and the mixture has thickened. Add the food colouring a drop at a time mixing well after each drop, until its the desired colour. Pop the ganache in the fridge to cool a little, so it doesn’t melt the frosting. Remove when it is cool to the touch but still quite runny. Finish off with the chopped walnuts on top and serve. 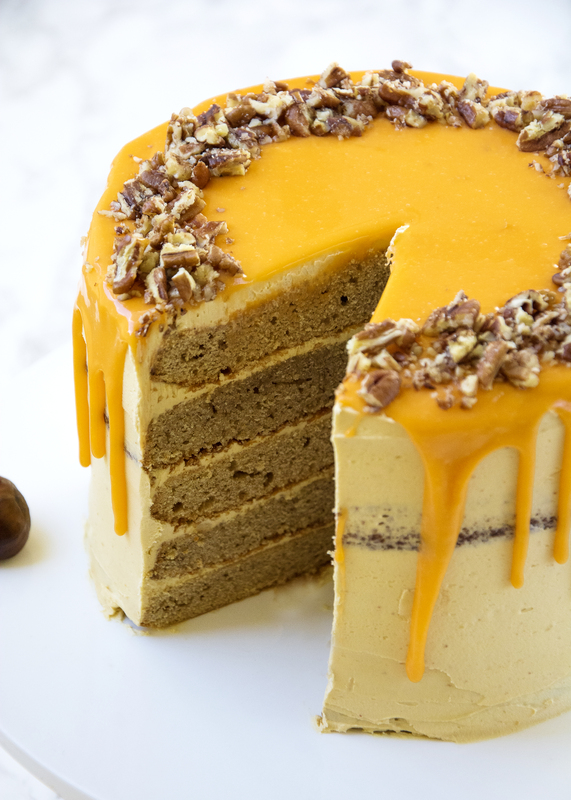 And there you have it, Pumpkin Spiced Latte Cake! If you give this recipe a try, let me know how it goes by tagging @whatseatingmanchester in your social media post. And if you want to see the real life Pumpkin head over to my Instagram for the photos! I’m definitely saving this recipe to Flipboard for later! That sounds great, they should work great! Any kind of squash should work fine, if I can’t find real pumpkins I just use butternut squash, same family and they taste pretty similar, once they’re in a cake you can’t tell the difference. This is beautiful! I’m dying to taste it! This cake is gorgeous and sounds amazing! 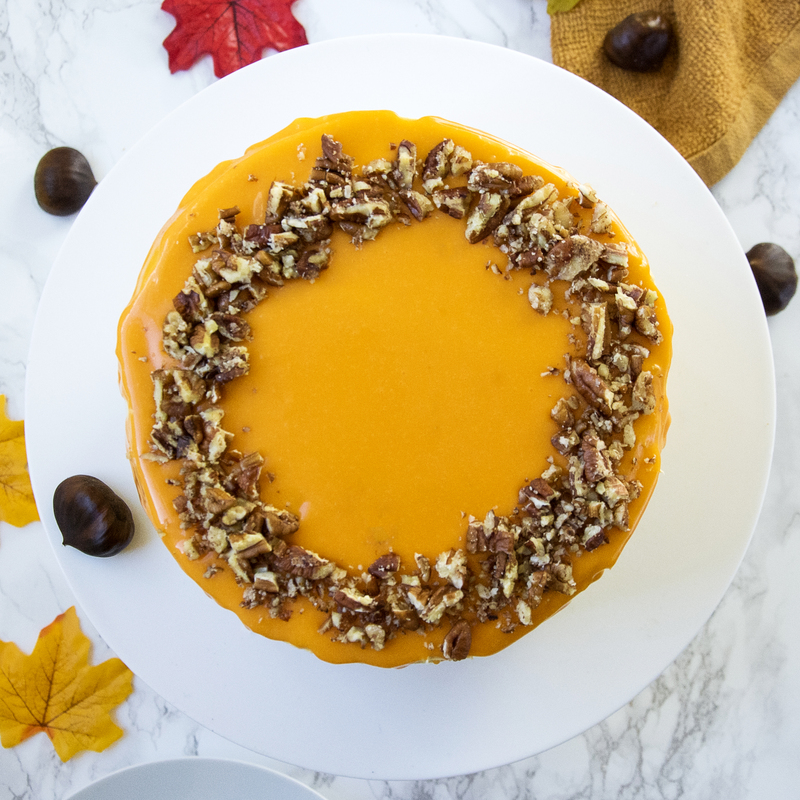 I love pumpkin, and the latte twist make it something I have to try soon! Thanks for sharing! 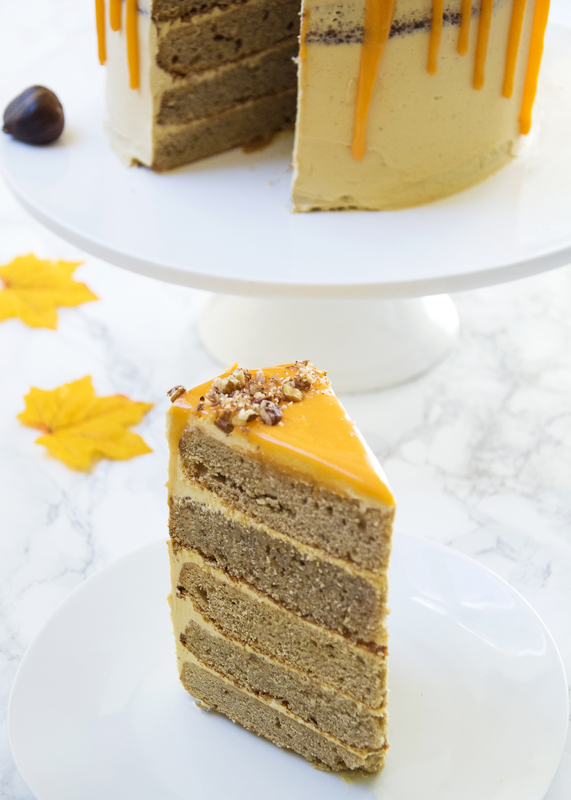 Oh my gosh, this cake is stunning with all of my favorite fall flavors! Yum!! We like your blog, it has unique information, Thank you!